Susan Sarandon looks at a work of art at the Outsider Art Fair. Photo: Olya Vysotskaya. NEW YORK, NY.- On Thursday night, over 2,500 fair-goers attended the opening day of the 27th edition of the Outsider Art Fair, the only fair dedicated to Self-Taught Art, Art Brut and Outsider Art from around the world. Guests representing the art, culture, fashion, and entertainment milieu attended an early preview held at the The Metropolitan Pavilion, located at 125 West 18th Street in New York City, including Actresses Edie Falco, Jessica Lange, Elizabeth Marvel, and Susan Sarandon; Musicians Jack Antonoff, Lee Ranaldo, Andy Rourke; Artists Maurizio Cattelan, Hugo Guinness, and Peter McGough; Curators Jason Busch, Matthew Higgs, Jeanne Greenberg, Anne Pasternak, Valérie Rousseau, Stephanie Stebich, and Max Hollein; Collectors Monty Blanchard & Leslie Tcheyan, Michael & Eileen Cohen, Marty & Rebecca Eisenberg, Agnes Gund, and Jacqueline Schnabel. "We are thrilled with the turnout. Our booth has gotten lovely reaction," said Susan Baerwald of Just Folk, who sold two artworks by outsider art staple Bill Traylor with an estimated value of $85-100,000 each. "We've had a very successful opening," she concluded. "I never thought I would be here, and I thank the fair immensely for giving me this incredibly opportunity," said first-time exhibitor Michelle Maccarone, who presented the work of Jim Carrey. The response has been overwhelmingly positive toward Jim's work, and the context could not be more perfect. This is a fair that is really about art." Ted Allen, Robert Aloia, Ian Alteveer, Anita Antonini, Eric Appel, Edgar Batista, Shai Baitel, Peter Beard, Alain Berdouare, Damon Brandt, Maureen Bray, Alix Brown, Gabriel Catone & Bruce Cohen, Ricky Clifton, Cheryl Dunn, Sara Driver, Pari Ehsan, Sophie Elgort, Eric Firestone, Joel Fitzpatrick, Charles Gepp, Alexander Gorlizki, Maggie Grise, Bob Gruen, Nish de Gruiter, Christina Japp, Rebecca Jampol, Anna Karlin, Carlotta Kohl, Christine Kuan, Tali Lennox, Brett Littman, Sydie Lansing, Karen Marta, Chris Martin, Nicolas Mirzayantz, Jose Parla, Jamel Robinson, Jane Kaplowitz Rosenblum, Lissa Rivera, Aurel Schmidt, Andres Serrano, Daphne Seybold, Emma Snowdon-Jones, Sarah Suzuki, Camilla de Terre, Eve Therond, and Ron Warren. Founded in New York in 1993, the Outsider Art Fair is the original art fair concentrating specifically on self-taught art, and exhibits works by acknowledged masters, including James Castle, Aloïse Corbaz, Henry Darger, Thornton Dial, William Edmondson, Martín Ramírez, Judith Scott, Bill Traylor and Adolf Wölfli, as well as contemporary figures like Monma, Susan Te Kahurangi King, Frank Walter and George Widener. Quickly recognized for its maverick spirit, OAF played a vital role in building a passionate collecting community and broader recognition for outsider art in the contemporary art arena. In 2012, OAF was acquired by Wide Open Arts, a company formed by gallerist Andrew Edlin. With its debut edition in 2013, the fair established the Curated Space and OAF Talks programs. The 2013 fair enjoyed rave reviews and more than tripled its previous attendance records. 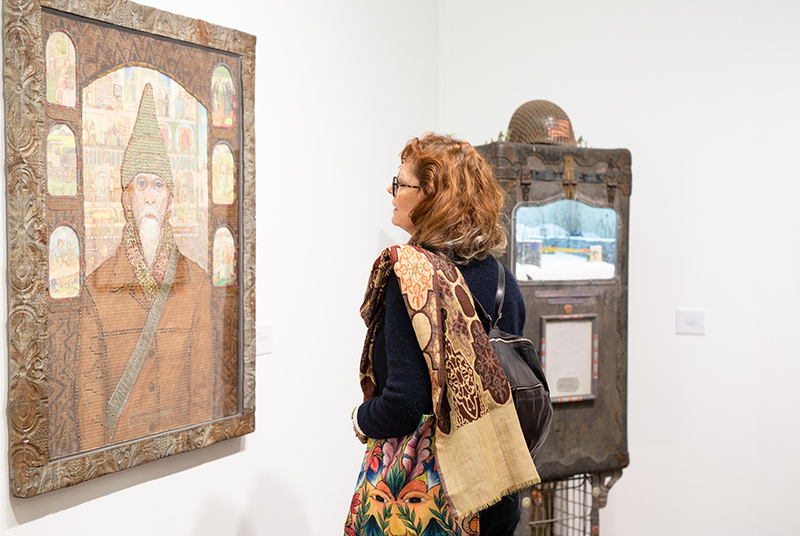 Propelled by this success, Wide Open Arts took the fair to Paris where it recently produced its 6th edition, helping to reinvigorate the citys long tradition of recognizing and championing art brut and self-taught artists.